I hope everyone who celebrates had a Happy Thanksgiving, a Happy Hanukkah (or both!) 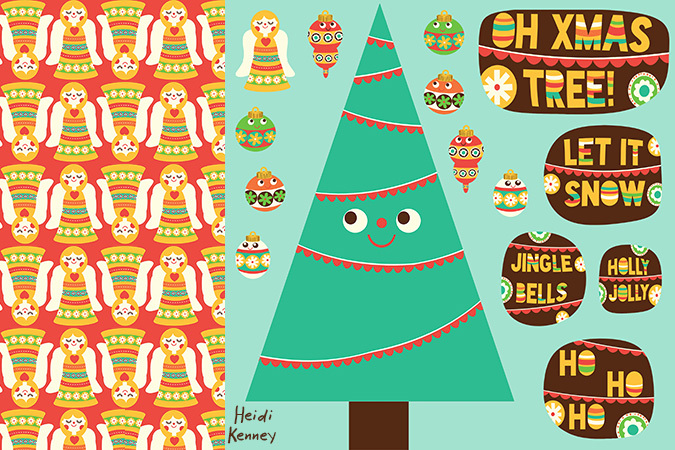 I created some new patterns on Spoonflower (which will be up for sale once I approve the proofs) A cut & sew Christmas tree, some patterned fabrics, and a wall decal. Now that Thanksgiving is over all the Christmas decorations are coming out! 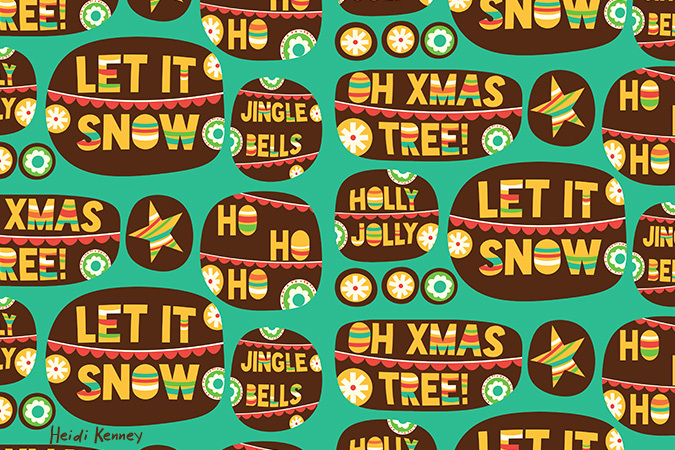 I’ll have the Christmas Music mixer available real soon too, so check back for that! This year I’ve been thinking about stash-busting and trying to use up some of my fabrics. I have a lot of really great fabrics, sitting on shelves and they need to be turned into cute things!! 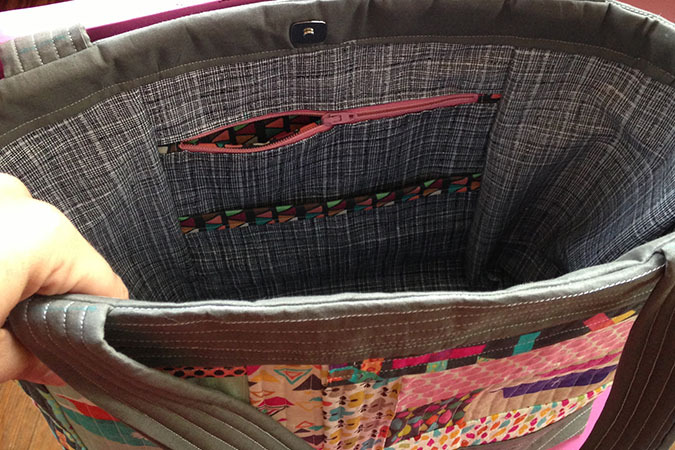 Recently I came across Elizabeth Hartman’s perfect quilted tote and decided I was going to buy the pattern and make myself a bag or two. I’ve made tote bags before, but they are just simple bags with out pockets, or magnetic snaps and I decided a pattern would be the best thing to force me to make something a little nicer. I loved the pattern, it has lots of photos, and is very easy to understand. It comes with two sizes and the absolutely only thing I didn’t love about the pattern is that some of the instructions are geared for the taller tote-and then some photos will say “do this for the wider tote but using these measurements” and it was fine, and I was able to do it. I would just prefer it had separate instructions for each one because occasionally I would read the wrong fabric size and get mixed up. 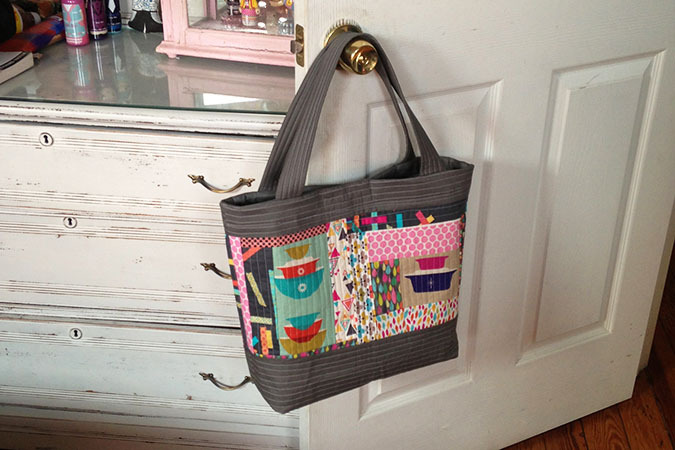 The first bag I made was patchwork, and still has a bit of mistakes. Your supposed to sew down the top band with stitching along the inside and as you can see I messed that part up royally! So when I gave away this top purse and decided to make myself a second bag, I hand stitched down the top band to avoid screwing up the stitching line, and it looks so much better. I’ll try and get a photo of the inside soon to explain what I mean. 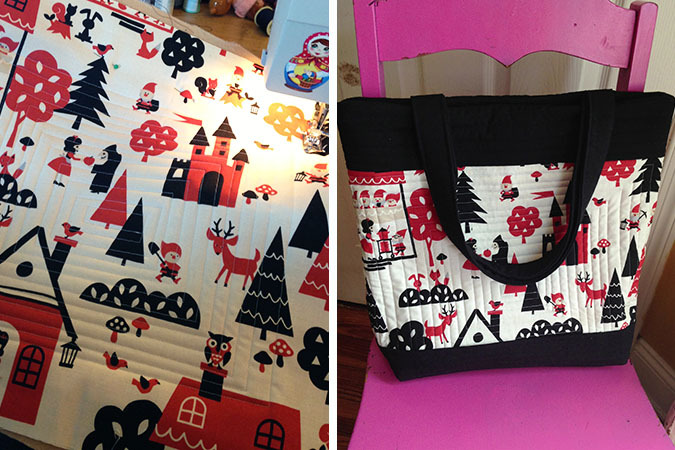 For the second bag I also decided just to use up this adorable snow white fabric (which I got here) Which I’ve been hoarding for awhile. It makes me so happy to use it. Next up I’d like to sew myself a wallet, but I am looking around for the perfect pattern. 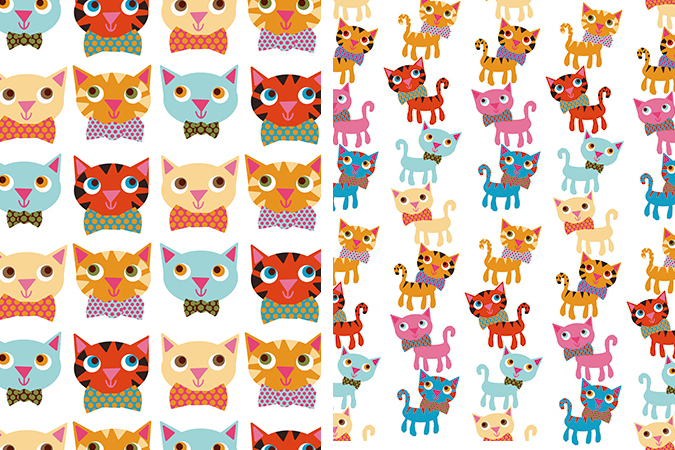 I’ve been working on some new repeat patterns in similar color combinations. 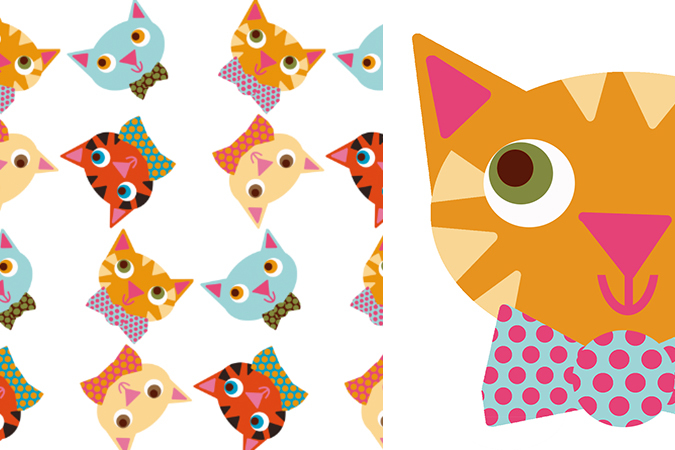 The cat-crazy patterns are because my youngest son is cat crazy and wants to have a cat-themed birthday party this year. I thought I could sew him up a couple of cat pillows for his bed. 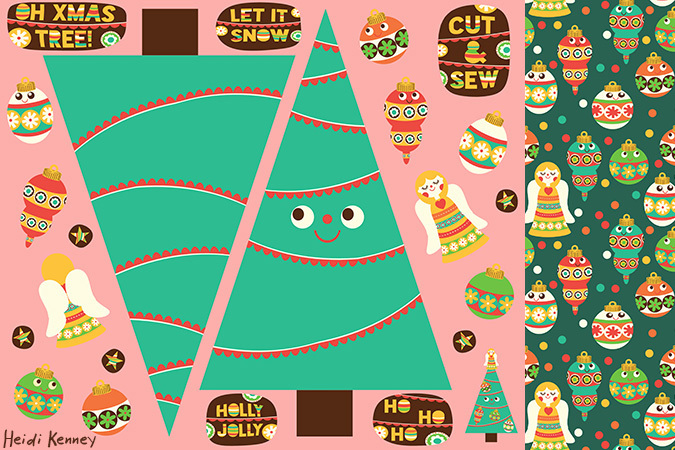 Then I started making a Goldilocks & The Three Bears repeat, which started with a house, which then turned into many houses. 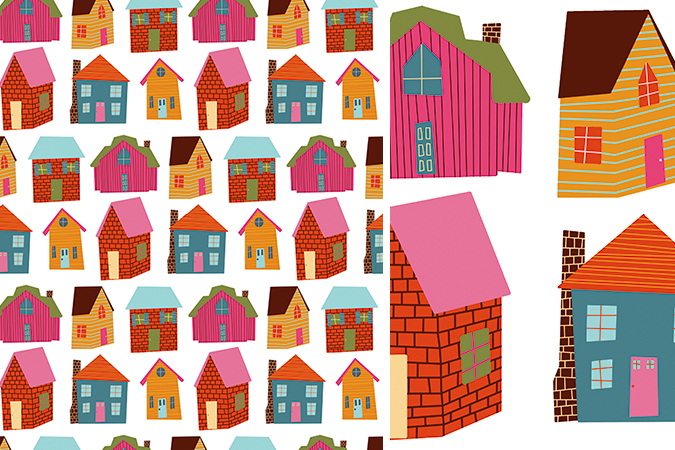 Maybe I’ll go back to Goldilocks but for now I had fun making the houses. Once proofed these designs will be available here.